The Birdist: New Audubon Column! Hi folks! 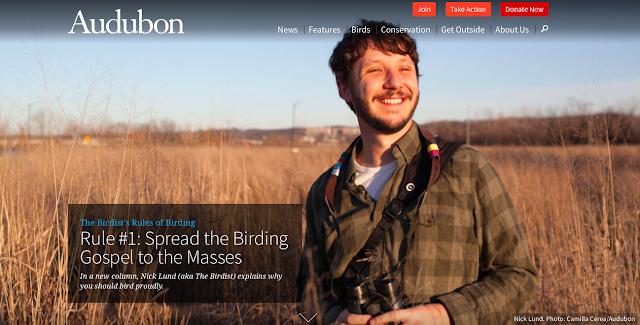 I am excited to announce that I'll be writing a new column, The Birdist's Rules for Birding, to run weekly on Audubon.org. It's aimed at newish birders, and the "bird curious" among us who want to figure out what this hobby is all about. I want to thank my editors over there for giving me this opportunity, it's going to be a blast! I don't post here too often, I know, but I will continue when I can, or when I have something to say that ain't right for Audubon. Thanks for reading all these years! Great article; I can't wait for the rest of the series. +1 for the Fort Wayne mention! Congratulations! So glad to have connected with The Birdist and now your Audubon column.